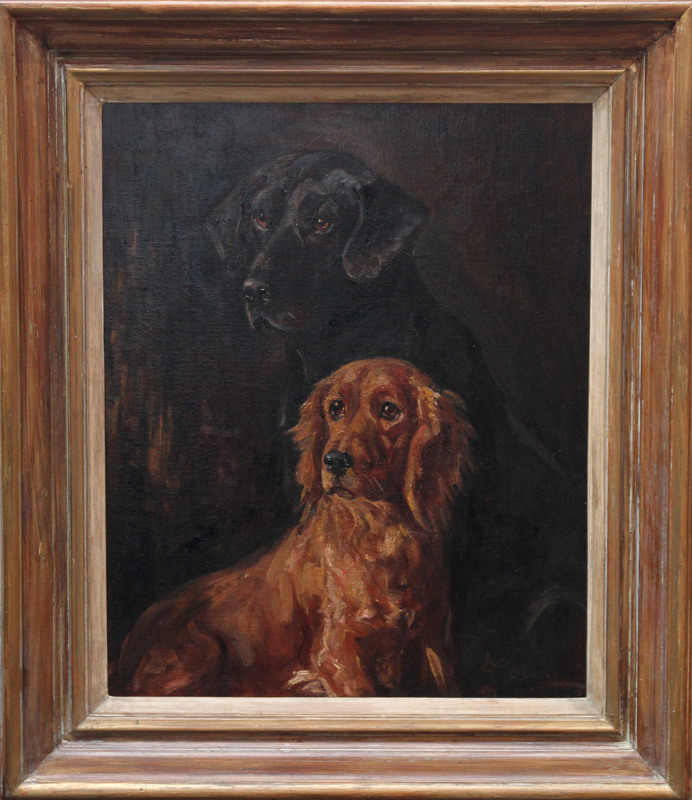 This gorgeous oil on canvas painting of two dogs is by noted British dog artist Lucy Dawson. 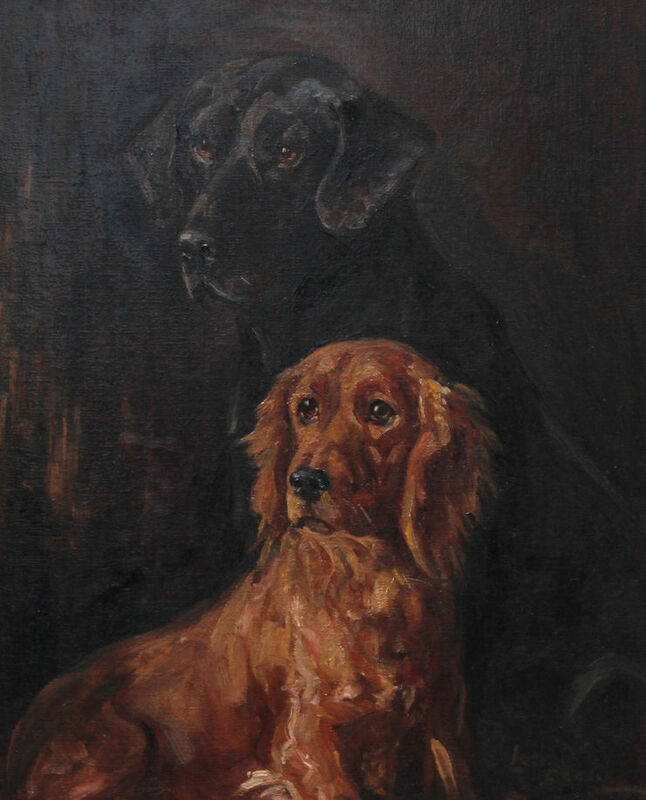 Painted circa 1930 the painting is of two Retrievers, a black Labrador and a russet working Cocker. They are both looking very attentively to the left, no doubt focusing on their owner and waiting for a command. Any dog lover will see that Dawson has captured their expression, body language and coat perfectly. A gem of a painting. Signed lower right. Housed in a fine Bourlet gallery exhibition frame that really compliments the painting, 28 inches by 24 inches and also in excellent condition. Lucy Dawson (1875-1954) was a British painter and printmaker best known for her portraits of dogs with sketched in backgrounds. Her charming sketches of every breed of dog are reminiscent of the work of Cecil Aldin. Though Dawson’s work was often reproduced for postcards made by Valentine & Sons she also was commissioned numerous times by the Royal Family to paint their corgi Dookie. This painting was later reproduced as the family's personal Christmas card. Dawson’s most adept media were graphite and pastel. She used color and line variation to focus on the subject matter and did not pay much attention to background details. Born in 1875 in Bristol, United Kingdom, little is known about her early life, other than that she moved to London in 1930 after the death of her husband. The artist wrote and illustrationed a number of books including Dogs as I See Them (1936), Dogs, Rough And Smooth (1937), Lucy Dawson's Dog Book (1939) and Neighbours (1939). Her drawing have also been in numerous British and American publications. Her pseudonym “Mac” can be found on some of her drawings. Dawson died in 1954 in Hertfordshire, United Kingdom. She exhibited for many years at the R.I. Galleries in Piccadilly, London.